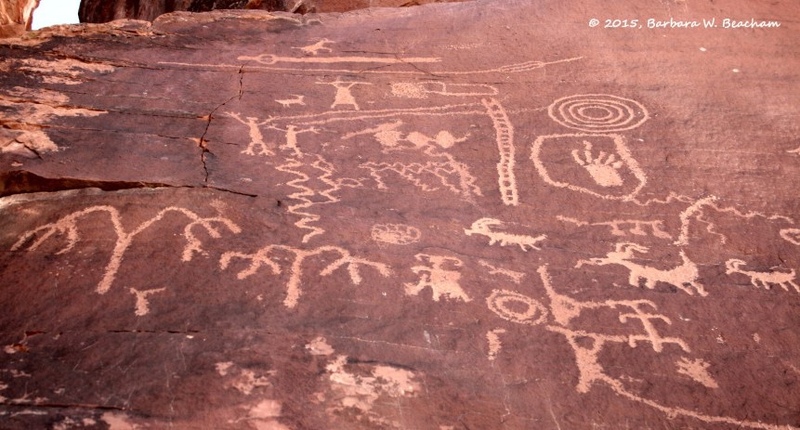 Professor Baird challenged his class to try and translate the message of the petroglyphs. I was anxious to meet his challenge but found it to be a lot harder than it seemed. 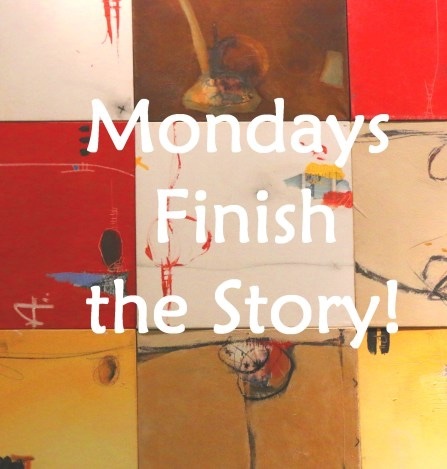 Thank you to Barbara Beacham for our photo prompt today and for hosting, Monday Finish the Story challenge. She gives us a photo prompt, the first sentence to our story, and approximately 150 words with which we are to write a story with. The challenge is fun and addicting and anyone is welcome to participate. To read the other participants' stories, click on the blue froggy button. I’m impressed! I stared at the photo for while to see if I could figure it out and got nothing!!! You did very well!!! Great story! Thank you so much! I wrote down things that I saw and that didn’t do anything for me, so I thought about it for awhile and just wrote down what came to me. LOL! It was kind of fun trying to decode it. I don’t think the professor was very sure of his interpretation. Well.. if you look at those little animals on the petroglyphs, they look like goats. LOL! Oh thank you Millie. I tried to figure out those petroglyphs. I saw the hand as meaning, “friendly.” LOL! Thank you! Millie, I sent out my FFfAW challenge post last night and I have not received even one comment on it. I usually get a like or two. Did you receive a challenge post for FFfAW last night? Hello PJ. Your FFfAW challenge post was in the Reader here twelve hours ago and you have 4 likes on it (one being Louise). I didn’t realise you had that as a separate blog, so I will click onto it now. I don’t understand why I am not getting those like in my comments as I normally do. This happened to Louise yesterday morning. I liked her post and it said so on my blog. But it didn’t show on hers. There’s something funny going on with this new system somewhere. I hope someone gets it sorted out soon! I do too. I am trying to figure out if I need to resend my challenge post. I am trying to find someone that follows my challenge blog, FFfAW, so I can see if it came into their email this morning. As I said, Pj, Louise got it, so I would think other people would have done. I’m trying to figure out if it went out to people that are following that particular blog, FFfAW. I’m not getting any type of feedback on it which is very unusual. Louise says she’s followed it for a while and she did receive the post. Did she receive it last night or early this morning? That is the one I am concerned about. She got it twelve hours ago – whatever time that would have been where you are. Millie, they are just now starting to come into my email comments. I guess there must have been a hold up somewhere with WordPress. Well that was fun! Interesting prompt and interpretation ! Thank you Jeff. I had a hard time with that interpretation. But that’s what it looked like to me. Goats were a fun addition. Thanks Jessie! I had a hard time trying to “read” the petroglyphs. This is what I came up with. LOL! Thanks Barb! I have been having trouble writing lately. Hopefully, this worked okay. You be well too! The first REAL Thanksgiving! Excellent! I agree they do look a bit like goats – a great take on the prompt. I think you are the only one that actually interpreted this petroglyph 🙂 I love the angle you took. Actually, now that you pointed out where everything is, I can see the picture more clearly. I dumped mine on Old Manu because I could not really tell..:) Well written. Thank you! I basically just wrote down what came to my mind after I analyzed it for a bit. Thank you for reading and commenting! You’re very welcome! PJ – best stories are told on impulse. I do the same – look and write down the scenes/story that appears in my head. That’s nice to know you do the same thing. Yes, you’re right, the best stories are written on impulse. Do you by any chance follow the blog, Flash Fiction for Aspiring Writers? I am trying to figure out if those who follow this blog received the challenge post in their emails last night as I am not getting any kind of feedback on it as I normally do. I know that WP has been having problems. Nice way to weave your interpretation of the image into a story. I wonder if the Professor itself knows the exact meaning here….Well done. Thank you Sonya! No, I don’t think the Prof knows the meaning and is just hanging on the coat tails of the student. I’m sorry, I accidentally called you Sonya, and I mean asunami. Nice interpretation! I had fun trying to work out the story of the petroglyphs too. I wrote down what I “thought” it looked like then tried to make a story with it. It was kind of fun to do although I know I am way off. haha! Haha! I looked at the pictures and wrote down what they looked like to me and then made a story out of it. I didn’t think I did a very good job. What little tiny bit of creativity I have has been AWOL. lol!